Family-owned through four generations, the Umdasch Group fully appreciates the classic values of corporate sustainability: reliability, trust, responsibility. 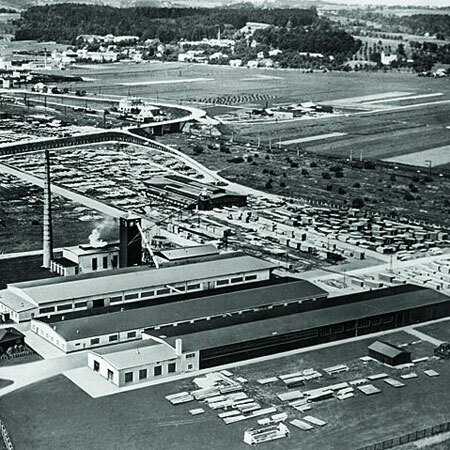 With about 8,000 employees and over 170 sales and logistics facilities on 5 continents, the Group has come a long way from its early days in its home town of Amstetten in Austria. A global perspective is essential for international success. So too are orientation toward world markets, flexibility and dynamism, and a willingness to change. All combined they are a tremendous success factor. Successfully combining them all is a huge challenge. The "Salone del Mobile" trade fair at the Fiera Milano exhibition centre in Rho is considered one of the most important and largest furniture fairs in the world and took place this year from 9 to 14 April. More than 2,000 designers from all over the world present their latest creations here: From padded furniture to wood, metal and plastic furniture, everything was there again. In addition to more than 300,000 visitors, our designers Julia Mitteregger and Phillip Zipfinger from umdasch Shop Consult were there as trend scouts to inform themselves about the latest trends for their work and to continue to design successful stores. The Umdasch Group is an umbrella organisation with three companies. Doka develops and produces formwork solutions for cast-in-place concrete construction. The portfolio covers everything from the world's most complex construction projects to classic single-family housing builds. It is a field that calls for specific engineering expertise just as much as innovative technology and decades of experience. 92 % of Group business is non-domestic, so the focus is sharply international. Umdasch Group Ventures deals with new technologies – particularly in construction. The company engages actively in models for optimization of the construction process in its entirety. By participating in or initiating research and development projects, through supporting technology start-ups and by acquiring companies that specialise in pioneering methods. Umdasch The Store Makers is a specialist in the field from which it takes its name. Consulting and project management make the company an important partner for trade and commerce – particularly whenever the need arises for innovative concepts combining classic business and digital trade. The Umdasch Group is the holding for the three operational businesses Doka, Umdasch Group Ventures and umdasch. A lean and powerful organisation is crucial for market competitiveness. The philosophy: Encourage businessmen and businesswomen in the business. That means: short reporting channels, shallow hierarchies, maximised decision-taking competence – and therefore responsibility – for the individual specialist sections. Corporate social responsibility has become the established norm in recent years, and sustainability and social responsibility in the Umdasch Group are a matter of course: without sustainability there can be no enterprise. Strong internationalisation and the associated activities in regions and countries with many different cultures gave us grounds to develop a code for a common understanding of the ethics of trading and co-operation. The Umdasch Group is one of the most tradition-rich family-owned companies in Austria. Its roots extend all the way back to 1868. Nowadays full use is made of metal and innovative composites, but wood is the material that shaped the character of the company. Do your part to ensure awareness for responsibility in your business milieu and if occasion arises, make use of our anonymous whistleblower system.